Deutsche Grammaphon, the world's longest-running classical label, kicked off its 120th anniversary celebration—bringing it within five years of its quasquicentennial—in grand style. The festivities began with a cross-cultural concert in Beijing's Forbidden City, the Imperial Ancestral Temple and palace complex during the half-millennium between the Ming dynasty to the end of the Qing dynasty. This was the first concert to be hosted there in two decades (in 1998, Zubin Mehta led a production of Turandot there that paved the way for Beijing being awarded the 2008 Olympics). 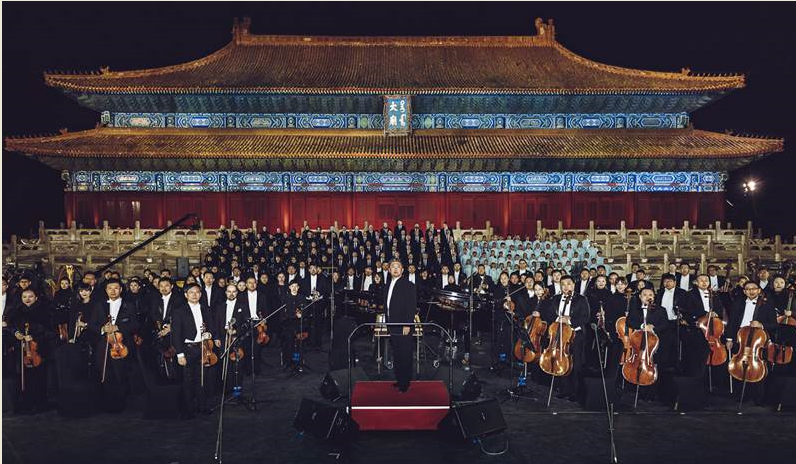 The music included the Shanghai Symphony Orchestra's presentation of "Carmina Burana," conducted by Maestro Long Yu, the first Chinese conductor to wave the baton in the Forbidden City. Soloists, meanwhile, came from Russia, the U.K. and France. Russian pianist Daniil Trifinov rocked some Rachmaninov. Liu Tianhua's "Enchanted Night" was accorded a special string arrangement; Max Richter's neoclassical work, as interpreted by Norway's violin marvel Mari Samuelsen with the Shanghai Symphony Orchestra, was also part of the program. Maestro Long Yu, piano prodigy Lang Lang and various Chinese music luminaries participated with the Deutsche Grammaphon team in curating the event. This historic musical gathering was made available as a live stream on multiple platforms, including YouTube's 360-degree virtual reality format; China's NetEase Cloud Music offered a delayed stream. More broadcasts are pending in countries around the world. "We are going to experience a cultural dialogue between the rich Eastern heritage and Western tradition," proclaimed DG President Dr. Clemens Trautmann in his welcome speech, "and isn’t this what Music is about? Building bridges. It’s a universal language that transcends any borders, barriers and boundaries. I believe it is important to remind ourselves of this fact, as the world gets increasingly fragmented and conflict-ridden. A Chinese Maestro, orchestra and children's choir join forces with soloists from France, Great Britain, Norway, Russia as well as with a wonderful choir from Vienna. Also, I find it fascinating that the Latin texts written by Bavarian monks, which form the basis for 'Carmina Burana' on tonight's program, came into existence roughly at the same time as the Forbidden City was built in the 13th century." In other pronouncements related to music, Cardi B tweeted this missive today: "TAKI TAKI RUMBAAAAA!!"